Navajo crafted sterling silver squash blossom necklace. Measures approximately 18" long and naja measures about 2 1/2" long by 2 1/2" wide. 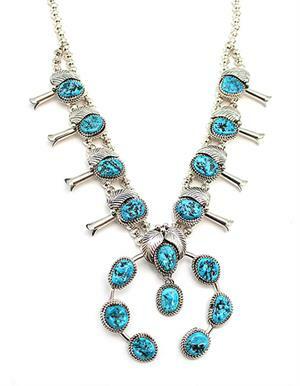 Crafted with natural sleeping beauty free form turquoise stones and sterling cast leaves. Stones will vary in shape and size.